With all the entertainment kids can engross themselves in today, so much of it is on computers, tablets, and PS4s that it’s nearly impossible to convince your children to venture outside. But sometimes they need just a nudge – an irresistible game suggestion – to coax them into the fresh air and keep them there. Here are our top pick of five of the best outdoor kids games around today. They all sound like so much fun, we’re sure you’ll want to join in too. Backyard cricket has stood the test of time in Australia’s arsenal of outdoor games. Family rules have been passed down through the generations. But the great thing about it is that so little equipment is required, and so simple (and changeable) are the rules, anyone can get involved. Backyard cricket is as easy as it comes. You don’t need bona fide wickets: use a tree stump, a garbage bin or an outline on a fence or brick wall. For the second wicket, you can just use a garden pot or even your pile of discarded jumpers as you work up a sweat. Forget about a true-blue cricket ball; they’re hard and likely to break your window – or worse, a neighbour’s! Tennis balls will do just as well, and they give an added bit of oomph the younger kids will enjoy. The only thing you may want to invest in is a medium sized cricket bat to suit adults and kids alike (since you’re sure to want to have a go at batting!). Of course, if you really don’t want to venture to the sports store, you can try any sporting tool, from tennis racquets to baseball bats. 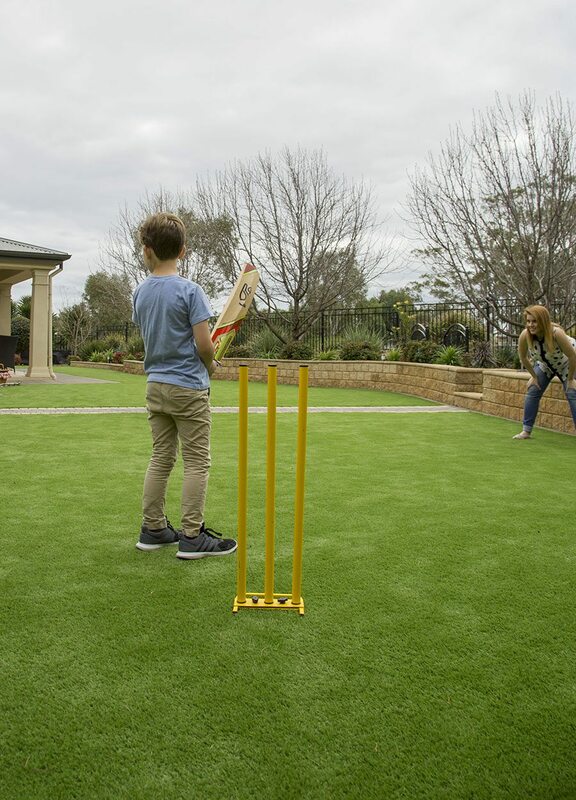 The rules for backyard cricket vary from family to family, but if the game is new to you, you’ll find a good outline of some rules brought to you by cricketer Steve Waugh, here. This is a popular game to keep the little tykes entertained during a garden party. Kids love a challenge, and nothing is harder than trying to balance an egg on a spoon while walking as fast as you can to beat your best friend. 1. Arrange the kids in a straight line. 2. Clearly mark the finishing line with ribbon or by simply picking a straight spot between two trees, posts, or piles of clothes. 3. Distribute spoons to each of the children and hard-boiled eggs (or golf balls if you’d rather save the food for eating!). 4. When you shout “go”, the kids begin to run. They must keep their free hand behind their back. If the egg falls, the child has to start again. 5. The first to reach the finish line without dropping their egg wins. There’s a reason skipping has remained a popular children’s sport over countless decades. You only need one skipping rope, and the game can be played alone or with many kids. An only child, as well as siblings, can get outside and have some fun. The variety of games and exercises kids can get out of skipping makes it a versatile sport for all, beginners and pros! The Skip-Hop website has a great list of skipping games the kids can try. The elastics game has swept through the world recently, making it one of the most popular outdoor games for children today. It requires the same clever footwork as skipping but provides a nice break from that more energetic sport. You need a loop of elastic, which is held up in a rectangular shape just off the ground using either chair legs or the legs of two willing participants. The “skipper” then tries an elastics routine decided upon by all participants. When the skipper fails to complete the routine, they take over one of the ends holding up the elastic and another participant has a go. There is a great selection of elastics games routines available online. The Kidspot website has plenty of options. OK, so unless you’ve got some outdoor paint and are willing to paint colourful circles on a portion of your yard, you’ll probably want to go out and buy the Twister board game from your local department store. Luckily, this game is guaranteed to keep the kids outdoors and entertained – you’ll probably hear their giggles from anywhere on your property. The rules: spin a board that dictates which coloured circle you must place either one of your feet or hands on. One circle, one hand or foot. Then sit back and watch the kids get incredibly tangled up. As soon as another part of the body hits the mat, you’re out – last person standing, (or in whatever bizarre position they may end up in) wins! Looking for more outdoor living inspiration? Yes, I would like to receive updates and promotional newsletters. Interested in one (or more!) of our quality outdoor products? At Australian Outdoor Living, all of our outdoor solutions are custom made to suit your particular specifications and needs. For this reason, we offer a free measure and quote service. Top tips for an eggcellent Easter hunt!